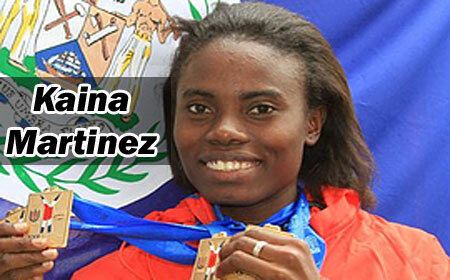 Posted: Tuesday, June 13, 2017–My name is Kaina Martinez, and I have worked very hard to earn the recognition as one of Belize’s most outstanding athletes. I am 11 times an All-American track athlete, 2 times an NCAA Champion, Olympian, Central American and Belize record holder for 100m, but above all, I am a young woman who finds passion and love in contributing to create positive change. Cognizant of the multitude of challenges facing my beloved community on a daily basis, I developed a focus to use sport as a catalyst to motivate the young and to nurture their minds, so that I could help build strong individuals who are willing to work hard – just like me – despite life’s limitations. The annual Kaina Martinez Track and Field Games targets children ages 4 to 14 years old, and has been hosted at the football (soccer) field in Seine Bight Village. Children of Seine Bight Village are not the only ones who can benefit from these games; all kids from the Placencia Peninsula are welcome to participate. I have always been proud of my ability to be an integral part of this event – from organizing, coordinating, coaching and even fundraising. It can be exhausting! I have always contributed money from my modest paycheck and receive small contributions from family and friends. However, to make this event accessible to all our Peninsula children and make it truly successful for them, I am humbly requesting your assistance to join me in the fundraising process. I kindly ask that you review our budget, and see how you can help in the wider effort to transform these children into great assets for Belize and the world. Thank you for your consideration. Please do not hesitate to contact me with any questions at the email address provided below.